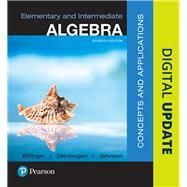 For courses in Beginning & Intermediate Algebra. The goal of the Bittinger Concepts and Applications Series is to help today’s student learn and retain mathematical concepts. This proven program prepares students for the transition from skills-oriented elementary algebra courses to more concept-oriented college-level mathematics courses. This requires the development of critical-thinking skills: to reason mathematically, to communicate mathematically, and to identify and solve mathematical problems. The new editions support students with a tightly integrated MyLab™ Math course; a strong focus on problem-solving, applications, and concepts, and the robust MyMathGuide workbook and objective-based video program. In addition, new material—developed as a result of the authors’ experience in the classroom, as well as from insights from faculty and students—includes more systematic review and preparation for practice, as well as stronger focus on real-world applications. Marvin Bittinger has taught math at the university level for more than thirty-eight years, and he is now professor emeritus of mathematics education at Indiana University-Purdue University. Professor Bittinger has authored numerous textbooks on topics ranging from basic mathematics to algebra and trigonometry to applied calculus. He received his BA in mathematics from Manchester College and his PhD in mathematics education from Purdue University. Special honors include Distinguished Visiting Professor at the United States Air Force Academy. His hobbies include hiking in Utah, baseball, golf, and bowling. Professor Bittinger has also had the privilege of speaking at many mathematics conventions, most recently giving a lecture entitled "Baseball and Mathematics." In addition, he also has an interest in philosophy and theology, in particular, apologetics. Professor Bittinger currently lives in Carmel, Indiana with his wife Elaine. He has two grown and married sons, Lowell and Chris, and four granddaughters. David Ellenbogen has taught math at the college level for nearly 30 years, spending most of that time in the Massachusetts and Vermont community college systems, where he has served on both curriculum and developmental math committees. He has taught at St. Michael's College and The University of Vermont. Professor Ellenbogen has been active in the American Mathematical Association of Two Year Colleges (AMATYC) since 1985, having served on its Developmental Mathematics Committee and as a delegate. He has been a member of the Mathematical Association of America (MAA) since 1979. He has authored dozens of texts on topics ranging from prealgebra to calculus and has delivered lectures on the use of language in mathematics. Professor Ellenbogen received his bachelor's degree in mathematics from Bates College and his master’s degree in community college mathematics education from The University of Massachusetts–Amherst. In his spare time, he enjoys playing piano, biking, hiking, skiing, and volunteer work. He currently serves on the boards of the Vermont Sierra Club and the Vermont Bicycle Pedestrian Coalition. He has two sons, Monroe and Zachary.